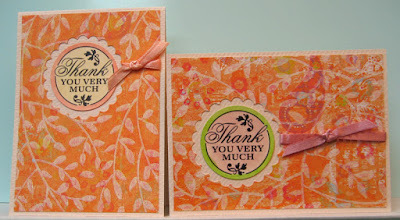 In response to a generous donation of cardmaking supplies I have created several sets of cards for a wonderful person!!! Some of the envelopes are 5.5" x 4 1/8" - just a bit smaller than the A2 sized envelopes so I decided to use these to make her a few cards. a border all the way around. I die cut scallops from the decorative paper, tied a ribbon or fiber between the opening and the edge and adhered these to the front of my cards. On the one in the lower left hand corner I sponged colour onto the card front before gluing the decorative paper in place. I watercoloured and sponged the my laser printed circle greetings to add a bit of colour and then adhered them in the openings. 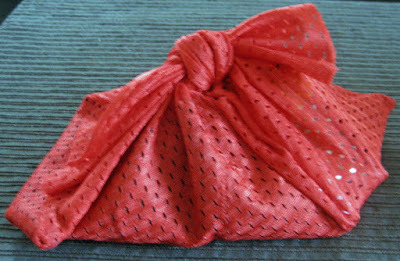 I changed up the ribbon/fiber and the orientation to give them each a bit of a different look.